Info "How do those eggs hover like that?" Cracked Up is one of Ashley's microgames in WarioWare: D.I.Y. The point of the game is to crack at least one of the eggs open over the frying pan. However, the eggs float throughout the stage, making this microgame somewhat difficult. Fortunately, there are three eggs. 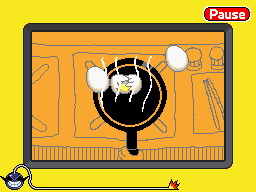 The game is won if the player manages to crack an egg open while inside the frying pan. However, if the cracked egg falls somewhere on the stove or if time runs out, the game ends in a loss. The background music is similar to the menu music in Super Smash Bros. Brawl. This page was last edited on July 17, 2018, at 10:02.